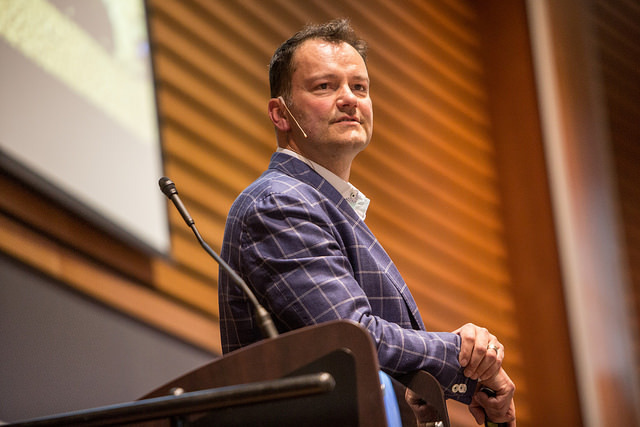 The Alberta tech community came together once again at AccelerateAB, held this week in Calgary. The annual event, which is put on by The A100 and The C100, is a celebration of entrepreneurship and tech startups in the region. Uzair Ahmed, cofounder of the Edmonton-based instaMek, said that though their startup is very early-stage, this was a good time in their company growth to receive advice from the mentors at the roundtables. The mentors at the roundtables were also impressed by the enthusiasm of the startups chosen for the sessions, as well as that of their fellow mentors. Day Two of AccelerateAB kicked off with the ‘Scaling up your startup’ workshop by Flightpath Ventures before moving into the public program, which was held at the Roderick Mah Centre for Continuous Learning at Mount Royal University. Lane Merrifield, co-founder of Club Penguin, kicked off the event. In the talk called ‘Lessons Learned,’ Merrifield spoke about his experiences and the challenges he faced while building his company, which he started with his co-founders as a safe place for their children. He also spoke about Club Penguin’s acquisition by Walt Disney. Merrifield was followed by a series of panels on building and growing startups in Alberta, which featured experts like Nigel Beck of IBM; Derek Ball, CEO and Co-Founder, atVenu; Steve Wandler, Co-Founder, Freshgrade; Ray Muzyka, CoFounder, Bioware; Mark MacLeod, CFO & Chief Corporate Development Officer, FreshBooks.com; Stephen King, Former CMO, Intuit; Mike Heffring, VP Corporate Development, Expion; David Edmonds, Industry Committee Chair, Accelerate Fund; Dan Park, VP Canada, Azure and many others. The conference was wrapped up by an enthusiastic speech from Jamie Clarke, CEO and Co-Founder of Live Out There Inc. Clarke’s inspirational speech featured stories from his travels around the world and the lessons that he applied to entrepreneurship. “I believe the heart of an adventurer and an entrepreneur are the same,” said Clarke to the attendees. Clarke also shed some light on the recent earthquake in Nepal, where he had traveled to many times and summited Mount Everest in 2007. Live Out There has raised $25,000 to donate to the Kunde Hospital in Nepal. The next AccelerateAB will be held in Edmonton in 2016.